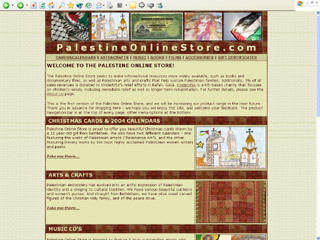 PALESTINEONLINESTORE.com sells books and documentary films about Palestine, as well as arts and crafts, and solidarity items. Its dual objective is to promote excellent resources about Palestine, as well as benefit the Palesitnian economy by marketing Palestinian-made products. A portion of the not-for-profit's proceeds go towards humanitarian relief in Gaza via the US-based charity KinderUSA. 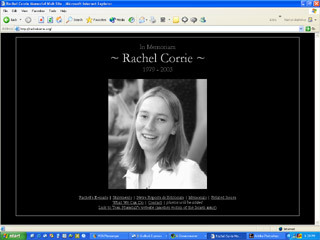 RACHELCORRIE.org is a site dedicated to the heroic American activist, Rachel Corrie. Rachel was mowed down by an Israeli bulldozer as she tried to stop it from demolishing a Palestinian family home in Rafah, Gaza. 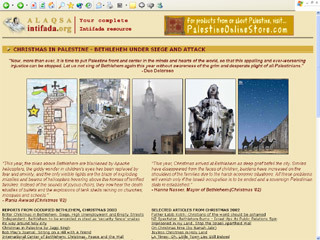 ALAQSAINTIFADA.org was our first website production. The website is geared towards providing information about the Palestinian intifada, including news, analysis, statistics, links, diary, martyrs list, and political cartoons. Unfortunately, the ALAQSAINTIFADA.org has been hijacked and is no longer under our control.